The Iranian government has restricted all journalists working for foreign news organizations from reporting on the streets of Tehran, where thousands have been gathering to protest the country’s disputed presidential election. What’s been harder to control is social media tools like Twitter, where thousands of users post and share information worldwide. Gaurav Mishra is the co-founder of social media research and analytics company 20:20 Web Tech and a 2009 Fellow at the Society for New Communications Research. He previously taught social media at Georgetown University and co-founded Vote Report India. He joined Worldfocus to discuss the role of Twitter in the aftermath of Iran’s election. Worldfocus: What role has Twitter played in the aftermath of Iran’s election? Has there been a “Twitter Revolution”? On a scale of one to 10, if 10 means it is a legitimate revolution, I would say Twitter as an organizing tool is at five or six. Twitter does play a very important role in some other areas. It has played an extremely important role in fixing the world’s attention on the crisis, both in terms of getting individuals like you and me to focus on the crisis, and also in getting the attention of the international media and making sure this crisis gets the amount of coverage it deserves to get. The #cnnfail meme on Saturday, which basically asked why the protests were not on the front page of CNN — that’s a very clear example that the activists know what they’re doing. They’re using Twitter to focus international attention on Iran, and to put this on the media’s agenda. Twitter users voiced their anger at the lack of media coverage of Iran. It’s very interesting — I see different stories happening. First is the story of the protest itself, and that’s a very big, legitimate story in itself. Then there’s the story about how Twitter and Facebook are being used to organize the protests. I think that’s a fake story. It distracts from the real issue, from the real story of these protests happening in Iran, which are the biggest protests since the 1970s. And it’s dangerous — we are telling them this is an organizing tool; that you can use this tool to organize protests. That’s not the case, because in countries like India or Iran, only single-digit percentages of people use Twitter. Clearly it’s not an organizing tool. The mobile phone is an organizing tool and e-mail is an organizing tool, because everybody has mobile phones in these countries. And the first thing you do if you want to organize a protest is send a text message to everybody in your address book. That’s how these protests are being organized in all likelihood, not via Twitter. Worldfocus: How have traditional blogs fared in Iran compared to micro-blogging tools like Twitter? The #iranelection feed on Twitter. Gaurav Mishra: We’ve seen that in all types of crisis situations — whether it’s the terrorist attacks in Mumbai, the China earthquake, or the Moldova protests, or elections in India or Iran — in all these kinds of big events, Twitter is great at giving alerts. You’re seeing a news cycle emerge where at first, stories are reported on Twitter. Then, blogs pick them up, they aggregate these stories and expand on these stories. They’re the first slightly detailed sense of what’s happening. And then the news organizations come in, and they write the 30-second piece on this, or do a deep story on it. And then we go into the context phase, where people add context to it and reference old stories — and this again happens both in the mainstream media and on blogs. And finally it goes through that news cycle, and after that context and analysis happens, people start reacting to these stories, in mainstream media and blogs — and again, the reaction happens on Twitter. So if you go through the whole news cycle, what’s happening is that in the alert stage, and in the conversation stage, Twitter plays a very important role. But in the stage of developing the story, giving it context, giving it analysis, blogs and mainstream media still play a very important role. Twitter very clearly doesn’t have a role in developing the story, giving it context and analyzing why is it important. Worldfocus: Why is it seemingly more difficult for the Iranian government to control Twitter compared to blogs and Facebook? Gaurav Mishra: Here’s the interesting thing about censorship and control. Typically how governments censor Web content is to ban specific URLs or specific IP addresses. So they would ban the Facebook IP address or the Twitter IP address or the blogger.com IP address or the wordpress.com IP address. In countries where most of the bloggers are on blogger.com, once you’ve blocked blogger.com, you’ve basically blocked all the blogs in that country. However, people like me host blogs on our own URLs and on our own servers. Therefore, unless the government has a database of all the blogs which are self-hosted, they can’t really block all blogs. You can block a blogging platform easily, but it’s very difficult to block individual blogs which are self-hosted. Facebook is fairly easy to block because most people who use Facebook actually go to Facebook and use it there. Twitter is interesting because most people who use Twitter don’t actually go to the twitter.com Web site. Most people who use Twitter go to something like TweetDeck, which is a desktop application, or one of the thousands of desktop applications to use Twitter. Or they use it via text messages. So even though you can block the twitter.com Web site, you can’t really block Twitter usage, because people can send and receive text messages, people can get tweets and send tweets on applications and it’s very difficult to block. On all these things, whether it’s blogs, social networking sites, news Web sites, Twitter, of course there are fairly simple ways to go around the censorship. People who are technically sophisticated find it trivial to go around censorship using circumvention tools. Worldfocus: Some Twitter users outside Iran have begun a campaign to change their profile location to Tehran, in order to shield Iranian Twitterers from government detection. Do Twitter users in Iran need this protection? And has it impeded or confused the flow of information from on the ground? Twitter users outside Iran have begun a campaign to change their profile location to Tehran. Gaurav Mishra: I think they do need this protection, because what’s happening in Iran is that a lot of people are joining Twitter, because they’re hearing about this. I saw some stats — a large number of people, some hundred, are joining every hour. The number of Twitter users in Iran is low, less than 10,000. Which means that when Twitter users join from Iran, it’s very easy to track them. Sometimes people don’t understand the complexity of this, and they reveal their location information. Then it becomes easy to profile them. I think it comes from a good place, this movement to change your Twitter location/handle to Iran to confuse Iranian authorities who might be looking to profile people. I do think the Iranian government has more important things to do. I’m sure they have a very sophisticated database of known dissenters, and they will first go after these people. These people who are joining Twitter — they are pretty low on the list of the Iranian government in terms of cracking down on them. I think it’s overkill, but comes from a good place. Of course it harms the information flow. 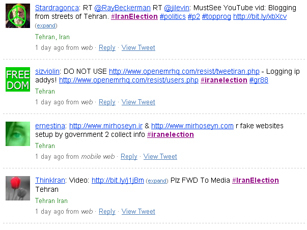 The only way you can make sense of the Iran feed right now, the #iranelection feed, is filtering by location. This misguided movement precludes the possibility of making any sense of what is happening now. It also precludes the possibility for academics to go back and make sense of it after it has happened. In the Moldova “Twitter Revolution,” a lot of people went back and saw all the tweets related to Moldova. They found that of the 700 people who were tweeting about Moldova, only 200 people were actually from Moldova. So it becomes very difficult for people to do that kind of analysis when the location information itself is misguiding. It’s harmful to do this in a way, because it breaks the validity of information and introduces more noise. But I think it comes from a good place, so I’m not criticizing the people who are trying to do this. Different people have different perspectives on what is important. Worldfocus: We’ve seen a lot of mainstream media sources quoting Twitter users in recent days. Are traditional media outlets embracing Twitter more so than in the past? View an interactive map of the Iranian blogosphere from The Berkman Center for Internet and Society. What’s happening in Iran is nothing new. We’ve seen this happen before, we’ve seen this happen in multiple locations. We should stop calling these things “Twitter Revolutions.” Again and again we call these things “Twitter Revolutions,” and Twitter is not at the center of revolution. Now, not only do citizens use [Twitter], but also political parties use it. In a country like India or Iran where most people are not on the Internet, political parties — especially the challengers, the incumbents don’t use it so much. Ahmadinejad did not usually use these tools, the Republicans in the U.S. didn’t really use these tools — but Democrats used it, Mousavi used it. These are great levelers that allow you to level the playing field with people in control of traditional media. I’ve seen this work in election campaigning, I’ve seen this work in protests — it’s the same dynamics happening in different situations, used by different kinds of people. We should start looking at it realistically and stop being surprised every time this happens. I’m not following this — tweetdeck, or any other twitter client still uses the twitter API to communicate with their servers — the same servers that serve the website. Blocking that wouldn’t be any more difficult than blocking the website. Incidentally, I think that’s why the web proxies have been so useful — because they’re a quick route to twitter and beyond..
As for SMS — that is an alternate route to twitter that circumvents the internet entirely.. But what is the level of control over the telco infrastructure by Iranian authorities? Do they have the ability to merely block all SMS to the twitter SMS destination? The mullahs may have long feared that change would eventually come in reaction to their abuse of the population. Many have moved the proceeds of their pilfering offshore, “just in case.” Some have built themselves Los Angeles and West Vancouver mansions, in anticipation that the gun might eventually not suppress the crowds in Tehran. The potential for change is directly conditional on the persistence and endurance of the youth filling the streets of Iran. It will be unstoppable if the demonstrations move to the poorer rural regions of the country. This genie is out of the bottle. Change may be slow in coming, nevertheless, it will come.